Claribel Nye (1889 - 1960) was a high school student when she came to Cornell in the summer of 1909 as a junior demonstration leader. 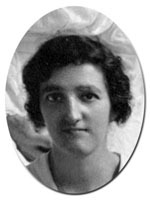 In 1910, Nye enrolled in the College of Home Economics. After graduation in 1914, she joined the home economics extension staff and traveled around New York, helping women harvest and preserve peaches and giving classes on baking to farm children. During World War I, Nye and Martha Van Rensselaer went to Washington, D.C. to assist Herbert Hoover and the Federal Food Administration. In Washington, Nye planned for the wartime emergency and assisted the food conservation movement. When Nye returned to Ithaca in 1918, she became the assistant state home demonstration leader and the state leader of Cornell Study Clubs. Before the passage of the suffrage amendment to the Constitution in 1920, Nye designed a curriculum for the Cornell Study Clubs called "Civics Programs" that encouraged women to take part in town meetings, contact city, state, and federal government officials, and vote as a civic duty. In 1927, Nye received her master's degree from Columbia University, where she specialized in child training, psychology, sociology, and family development. Three years later, she left Cornell to become the leader of home demonstration for Oregon and later California. Nye never married and retained her close friendships among the home economics faculty and staff at Cornell. In 1940, Flora Rose joined Nye in California.